Do you need a large inflatable rental for large event in Rochester? HOB Event Rentals has obstacle course rentals that can entertain your big crowd. These huge inflatable course are more than just a bounce house. They give the racers plenty of inflatable obstacles to create some friendly competition as add tons of fun. 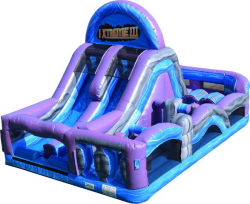 Our Xtreme Obstacle Course finishes big with a slide that you won’t want to miss! We all played Hungry Hippos as a kid; what if you could play the human size inflatable version? Click here to see. HOB Event Rentals is a family owned and operated family company that has been serving Rochester, Il since 2010. We delivery your Obstacle Course rentals early so you can enjoy the full 8-hour party rental. We pride ourselves on our large inflatable and interactive selection, as well as outstanding customer service. When you rent with House of Bouncers, you won’t be disappointed. Contact us today!